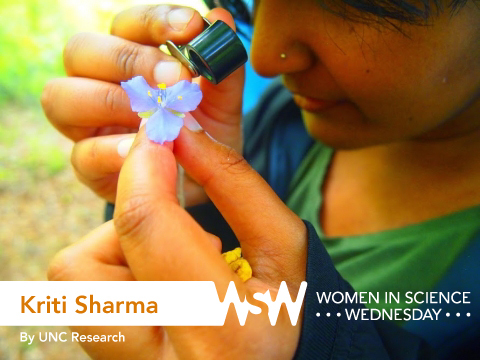 Kriti Sharma is a PhD candidate working in the Shank Lab. Her research focuses on understanding the microorganisms in soil that are quietly working to make life above ground possible. As a UNC microbiome researcher, she recently represented the university at the White House’s National Microbiome Initiative launch. From first grade through my undergrad years, the order went something like this: a naturalist, a poet, an environmentalist, a journalist, an international development officer working to end hunger, a philosopher, a nonprofit worker, an author, a member of a worker-owned collective, and a monk. Really good writing – poetry, philosophy, and nature-writing specifically. After graduating from UNC as an undergrad, I bought a $25 library card to be able to continue to access the library. I read lots of books on my long bus commute to and from my job at the EPA in RTP. By reading a lot of thoughtful and poetic writers, I found myself more and more astonished by my own aliveness. Essayist Annie Dillard wrote that it is “one of the few questions worth asking, to wit, What in the Sam Hill is going on here?” I thought, “Yeah, seriously – here we all are, alive! What in the Sam Hill is going on here?” So I applied to grad school in biology based on a gut feeling, an intuition that I would learn something important about life and aliveness there. I wasn’t wrong. What’s the funniest part of your research? My research involves creating new methods for visualizing how soil bacteria live in the fascinating, maze-like structure of soil. “Creating new methods” includes a lot of prototyping and trial-and-error, which basically means that it’s always arts-and-crafts-hour at my lab bench. It often feels absurd: autoclaving pipecleaners to clean out bacterial growth chambers, figuring out if rubber cement or school glue works better to stick chambers to a microscope slide, and using Shrinky Dinks to make molds. I look at the assortment of craft supplies on my lab bench and wonder, am I working towards a PhD, or still trying to pass kindergarten? What advice would you give to up and coming female researchers in your field? Surround yourself with good people – wise, kind, grounded people, who are genuine with you, and relate with you – that’s more important than whatever is written on your CV.